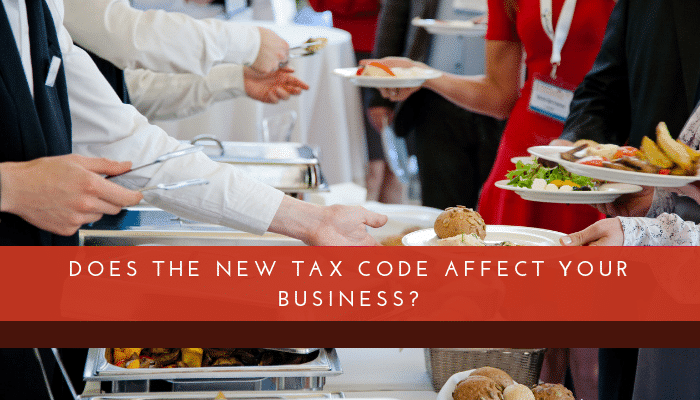 Does the New Tax Code Affect Your Business? There are several changes in the new tax code that may or may not affect your sales. We are particularly concerned about lunch and daytime event sales, as these are the areas that could be affected the most. Code section 13304 in the Tax Cut and Jobs Act (TCJA) amends the IRC section 274 about meal & entertainment expense deductibility. The 50% limitation under the previous law applies only to expenses for food and beverages for both entertainment and qualified travel under the TCJA. The deductibility (50%) of food and beverage expenses has not changed regarding the ability for businesses to entertain clients at lunch, dinner or at client events. We hope that this will remain unchanged, as it is particularly important for lunch and daytime events. The more significant change is that employers can now only deduct 50% of expenses for providing meals to employees, down from a 100% deduction. This could certainly influence lunch, dinner, and events. Businesses celebrating someone’s birthday, farewell, promotions, etc. by taking their staff out to lunch/dinner are now at half of the previous deductible level. You may want to monitor this and implement some kind of loyalty program or promotion to keep these types of events coming to your restaurant. For amounts incurred and paid after December 31, 2017, and until December 31, 2025, the TCJA limits expenses of the employer associated with providing food and beverage to employees through an eating facility that meets requirements for de minimis fringes and for the convenience of the employer to 50%. Such amounts incurred and paid after December 31, 2028, are not deductible. De minimis fringes are basically benefits given to the employee that are so small, it would cost more to account for them than they are worth. You should also check with your tax provider as to how you have treated “family meal” in the past as this could also affect your ability to write off that expense at 100% and reduce it to the 50% level. The biggest change for businesses is probably the new treatment of entertainment expense. How this may affect your business or your vendor relationships is that those types of expenses are not deductible at all. Entertainment expenses directly related to a taxpayer’s active trade or business that are no longer deductible include golf outings, fishing trips, tickets to professional sporting events, wine weekends and theater tickets, etc. It will be up to each vendor to decide whether they will still have these types of tickets available for clients/restaurants, but if they do it is at a no deduction for them. I think you should anticipate these types of perks we are all used to will become less available.